As temperatures down South dip into the 40s and 50s, tasteful seasonal decorating requires at least one nice gourd on the front porch. 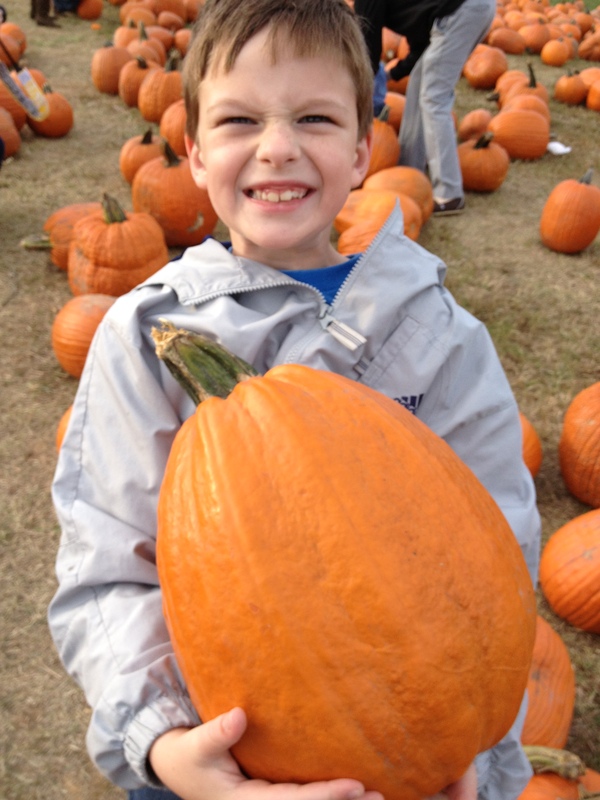 Carlton found the perfect sized pumpkin for him at Berry Patch Farms. Some of you have been so eager for fall temperatures that you ran out and bought a pumpkin when they first arrived in stores or when the pumpkin patches first opened in late August or early September. Sadly, those early pumpkins are now rotten piles of mildew and orange goo or have long since been discarded. 1.) 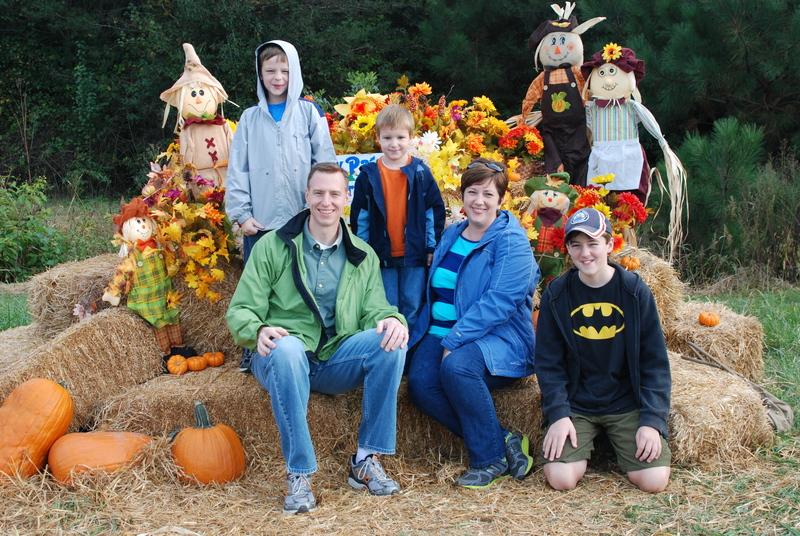 Pumpkin patches are fun. In my mind, the more authentic the pumpkin patch, the better, but we’ve seen everything from a random assortment of pumpkins laying out in a field to a church selling pumpkins from their front yard to the grocery store to Stone Mountain’s annual Pumpkin Fest where pumpkins are tucked in around the granite boulders. 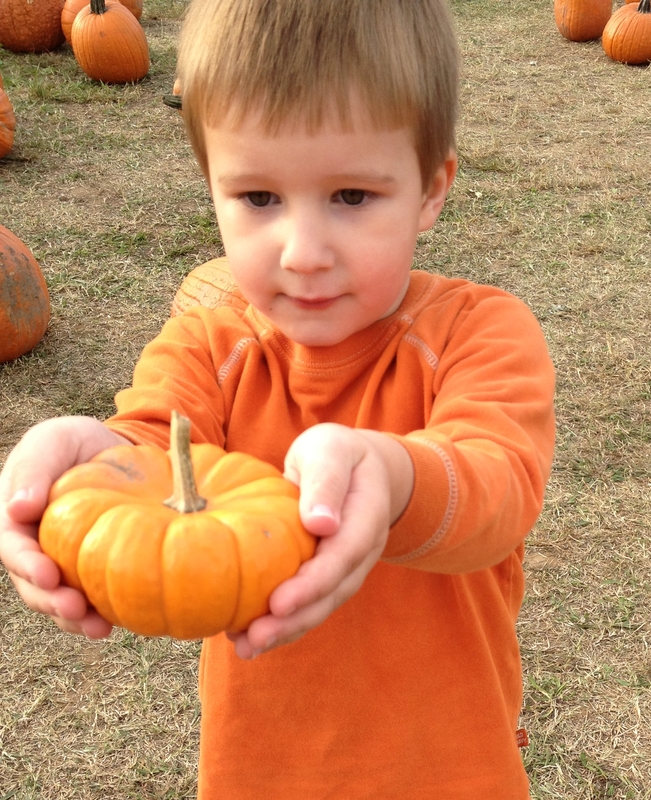 Pumpkin patches are usually accessorized by hayrides, corn mazes and an assortment of fall foods. To make things easier for you, I’ve found a website listing pumpkin patches throughout the Peach State. Harris likes his pumpkins a little bit bigger. 2.) Purchase pumpkins where you buy your fruits and vegetables. At most of the pumpkin patches I’ve visited, you spend all your money doing the ancillary activities so that by the time you’re ready to pick out your pumpkin, you can’t really afford a nice gourd. Here’s a hint: you can buy the same size or larger at the grocery store for a fraction of the price of a pumpkin patch pumpkin. I apologize to all the pumpkin patch fundraisers out there, but I am duty bound to report this consumer fact to all of my loyal readers… well, both of my loyal readers. 3.) Pick a pumpkin that wasn’t picked in July. The firmer the pumpkin, the fresher the pumpkin. If it gives when you press on it, then it’s ready for the compost heap, not for carving. And if carving isn’t really what you had in mind, there are lots of varieties of guords that may meet your needs better. You can learn more at this site. 4.) Roast the seeds. In elementary school, I had a teacher who handed out roasted pumpkin seeds as rewards. Perhaps I have too much of a psychological investment in pumpkin as a result, but roasted pumpkin seeds are at least as good as sunflower seeds without all the spitting of hulls. We have trouble getting the process right and typically burn ours, but according the pumpkin recipe page, 225 degrees for an hour should do the trick. Doesn’t the fall just bring out our family’s togetherness? 5.) Start a family tradition. You don’t have to sit in a pumpkin patch at midnight on Halloween to have a great time with gourds in the fall. Every element of the pumpkin process from the selection to the carving makes for great photos and even better memories. Growing up, my family never really bothered with pumpkins, but Carla and I have purchased at least one pumpkin every year since we had kids. Some years were so busy that we didn’t bother to carve them, but having pumpkins is one of the highlights of our family’s fall activities. Better get your pumpkin today. The pickins are getting pretty slim at the farms and patches. Pretty soon, all that will be left are the rotting, decaying or mishapen pumpkins, and no one wants a misfit pumpkin on their front porch. Where do you get your pumpkins? How many do you buy each year? Do you roast the seeds or try to use the entrails for pumpkin pie? Don’t hold back! Share all your pumpkin secrets by leaving a comment below. This entry was posted in Uncategorized and tagged Berry Patch Farms, children, choosing a pumpkin, contemporary South, decorating, family, farming, front porch, Georgia, Halloween, home decor, Lance Elliott Wallace, Lance Wallace, New South, New South Essays, NewSouth, pumpkin patch, pumpkins, South, Southern, Southern Culture, Southern Living, Southerners, the South, traditions. Bookmark the permalink. We never had any pumpkin patches in Texas where we lived. That is definitely a New South tradition.